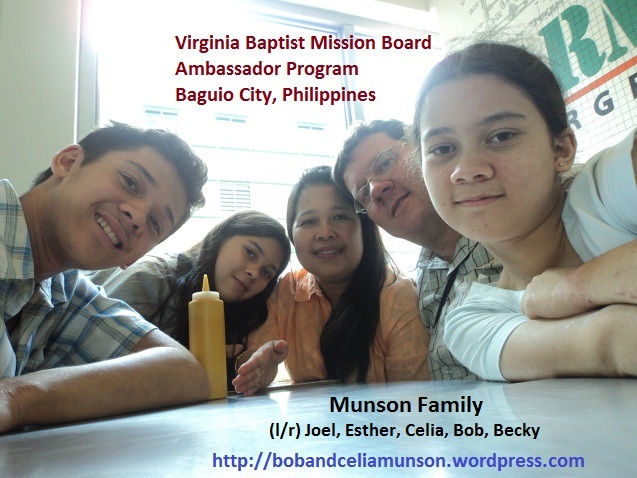 My name is Bob Munson, and my wife Celia and I serve in Baguio City, Philippines. We have been here since 2004. What do I do? 1. Teach. I am on the faculty and teach various missions topics and occasional pastoral care topics at Philippine Baptist Theological Seminary (PBTS) and Asia Baptist Graduate Theological Seminary (ABGTS) in Baguio City, Philippines. I also presently serve as the Dean of Students at PBTS. 2. Write. I blog here and elsewhere. I have finished four books… one on medical mission work in the Philippines, one on story and culture, one on cultural anthropology, and one (strangely) on pastoral care. You can check the MY BOOKS page on this blogsite..
3. Organizational Work. Celia and I co-found Bukal Life Care & Counseling Center back in 2009. We are focused on training in areas of pastoral care, crisis care, CPE, and chaplaincy training. Celia is a Diplomate in CPE/CPT Supervision with CPSP/CPSP-Philippines. We cofounded CPSP-Philippines, a certification/accreditation board for pastoral counseling, clinical chaplaincy, and CPE, that works in partnership with CPSP (in the US). That was in 2012 and we are still moving forward with it. We also cofounded DPDM, a medical mission group here in the Philippines. We were with them from 2005 to 2009. 4. Counseling. Celia is a counselor… but I do assist at times, and especially do work with counseling as part of missionary member care, and pastoral recovery. We have three children, all three of whom are in college. Our email is munsonsbaguio@gmail.com. I would love to sound like an expert, but I can’t because I am not. I would say that it would be good to get as much training as you can in cross-cultural counseling (and x-cultural communication). Some axioms in “Western” psychology don’t apply in other cultures. Western counseling disapproves of triangulation, but it is simply an unavoidable reality in others. Direct language is considered best in the West, but comfort in indirect communication is necessary in many parts of the world. Additionally, the Individual is assumed to be the most important social unit (with corresponding importance for individuality and individual freedom) in the West. Yet in many parts of the world this basic premise is challenged. The goal of cross-cultural counseling is NOT to get other cultures to think as Americans. I wish you well in your studies and calling. I had the opportunity to spend the summer working with IMB in the Philippines this last summer and I fell in love with the people there. Keep letting God use you! and keep posting. Blogs like this are such an encouragement. Reading about advancements in the Kingdom of God always makes my day brighter. Thanks. And I am glad you enjoyed your time here. It is a beautiful place with beautiful people. Looking at your blog, it sounds like you were involved in Nehemiah Teams. That is a great organization and I am very happy that the IMB has kept that program alive here in the PI.